– Why Isn’t The Canadian Government Talking About This? In this new story over at Ammoland Shooting Sports News they report upon a very large elephant in the room in Canada, and thus North America, that everybody has missed regarding the recent terror attack in Toronto that resulted in the deaths of 2 with 13 injured. Less than a year earlier, one Fahad Hussain, the brother of Toronto terrorist Faisal Hussain, had the home where he had lived raided by police who found not only 33 guns but 42 kilograms of Carfentanil, a drug called 100 times more dangerous than Fentanyl. As the Ammoland story reports, while discovered by drug dealers, Carfentanil can also be used as a chemical weapon and can be purchased online and has been banned from battlefield use by the Chemical Weapons Convention. 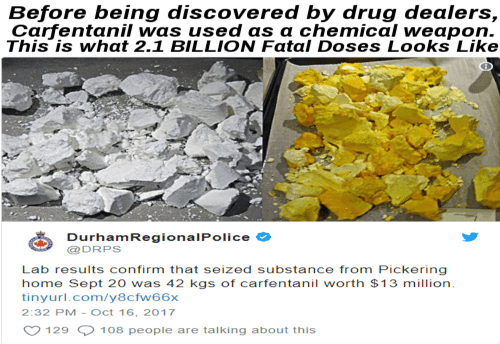 And while nowhere near as well known as Fentanyl and the rash of deaths it has caused to drug users all across America, Ammoland reports the amount of Carfentanil found in the home of the Toronto terrorist’s brother last September was the equivalent of 2.1 billion FATAL doses of the drug.